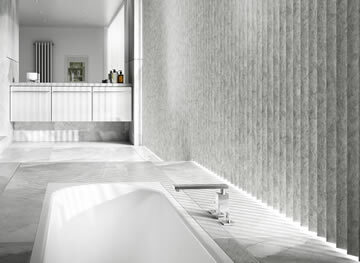 Roller blinds are an excellent choice for any wet room or bathroom window. Our gorgeous collection of luxury plain and patterned PVC Waterproof fabrics means there is a beautiful design to suit any décor. They are ideal for rooms where moisture and humidity are present or where the blind is likely to get wet. All the beauty of real wood with all the practicality of faux wood. Our stylish collection of luxurious faux wood blinds is ideally suited to humid and steamy spaces. They’re waterproof, extremely robust and won’t warp. Available in a beautiful choice of colours and wood stains, they are perfect for that natural look and feel. Often overlooked as a way to dress a bathroom window, modern vertical blinds are a great choice if you require a greater degree of light and privacy control. With our wide range of waterproof PVC and Vinyl fabrics for humid rooms in both plain and patterned designs, there is something to compliment any colour scheme. The sleek lines and timeless styling of an aluminium venetian blind look great at the windows of a contemporary bathroom. They can withstand a fair amount of water and are good in relatively humid and moist environments. They are a stylish way of adding a pop of colour and offer excellent light and privacy control. If moisture and humidity are not an issue in the room and the blind is not likely to get wet, then our luxurious wooden blinds are a wonderful way to bring a natural look to the window. Featuring a wide range of wood colours, grains and textures along with contemporary painted and gloss finishes for a contemporary look. 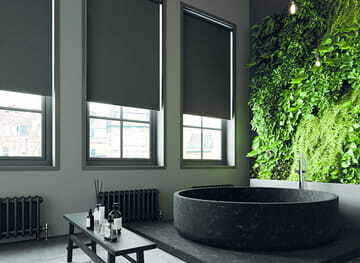 Although not water resistant, roman blinds do look fabulous at a bathroom window. They are only suitable if they are not going to get wet or be subjected to moisture directly. 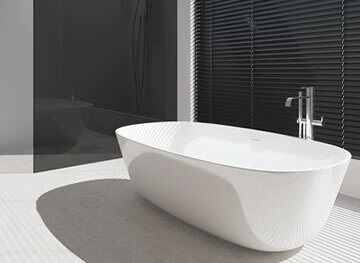 They generally work well in larger bathrooms that have plenty of ventilation and where the blind is not situated too close to the shower or bath. When choosing which made to measure blinds are most suitable for your bathroom window there are a few things to consider, due to the fact that bathrooms tend to be moist and humid environments. How wet or damp the blind is likely to get? This will obviously depend on how close it is to the shower or bath. At the very least it is quite likely to get damp or moist due to the condensation in the room. If the blinds are likely to get wet, then the best solution is to choose a PVC or vinyl fabric or wood that is highly water resistant. Our easy wipe-able and washable designs are available in our PVC waterproof faux wood blinds, roller blinds and vertical blinds section and are the ideal choice for any bathroom. We also have some beautiful blackout fabrics amongst our bathroom blinds collection if you need to dramatically reduce the light, and require complete privacy at the bathroom window. 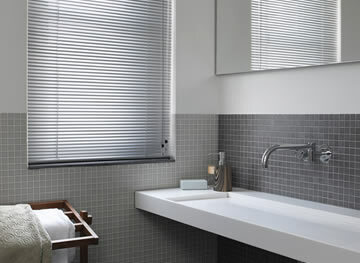 Another consideration for your bathroom is our aluminium venetian window blinds. These are resistant to water and condensation and extremely easy to clean, simply wipe them down with a damp cloth. They also afford you extra privacy whilst at the same time keeping the room nice and light due to their ability to tilt the horizontal slats to almost any angle you require. Venetian blinds also offer a wonderfully modern and contemporary look at the window if this is the effect you are looking to achieve. They are available in wide range of stylish metal colours, designs and finishes. Our faux wood blinds are the ideal choice if you are looking to bring a touch of nature to the windows. They are tremendously hardwearing, robust and waterproof, so perfect for areas of high humidity. Real wood venetian blinds also look stunning and are an extremely effective window treatment, just bear in mind they are not ideally suited to a humid bathroom or getting very wet as they’re not completely waterproof. They can withstand a certain amount of moisture, but if they are likely to get soaked on a regular basis there is a chance the wood slats may warp. This can be overcome to a certain extent if they are dried off immediately. Another consideration if you want that real wood look is our wood effect metal venetians, which you will find in our venetian blinds section. 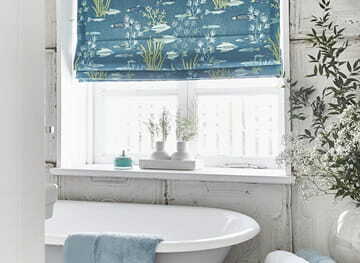 If you are looking for a particularly lavish and luxurious look in the bathroom and the windows are far enough away from the shower or bath so that water is not an issue, then our gorgeous collection of made to measure roman bathroom blinds features a wonderful choice of stylish designs From vintage embroidered fabrics through to more modern and funky patterned designs in bright and bold colours, there is a fabric to suit any style of bathroom and really bring the windows alive. Our luxurious range of wet room, shower and bathroom blinds is made to the highest standards using only the finest fabrics, materials and components to ensure they both stand the test of time and look fabulous. From our elegant made to measure waterproof bathroom roller blinds to our stylish venetian blinds they are all available to buy online and are delivered direct throughout the UK at discount web prices. If you are currently looking for inspirational design ideas then why not take advantage of our free sample service.